Lastarria volcano, Chile. Credit: Yves Mousallam (Scripps Institution of Oceanography, USA). Catch up on the latest from the Trail by Fire Expedition. You'll notice the Deep Carbon Observatory Newsletter has a new look. If you have any feedback, please contact the DCO Engagement Team. Following the two very successful International Diamond Schools held at Padua, the DCO Diamonds and Mantle Geodynamics of Carbon Consortium will host a 3 day International Diamond School in 2016 on Diamonds and their cratonic mantle hosts at the University of Alberta. Website forthcoming. Initial expressions of interest can be sent to Graham Pearson. The 4th International Workshop on Highly Siderophile Element Geochemistry is hosted by the Durham Geochemistry Group of the Department of Earth Sciences. DCO will hold its second Summer School in Yellowstone National Park from 23 - 28 July 2016. This Summer School will introduce approximately 35 students and early career researchers to the interdisciplinary concepts, which are the cornerstone of DCO’s approach to understanding Earth. Application deadline: 1 March 2016. Serpentine Days is an international workshop supported by the Societé Francaise de Minéralogie (French mineralogical society) focused on multidisciplinary research on serpentines and serpentinization. The workshop seeks a broad range of applicants interested in discussing the scientific motivations for an interdisciplinary earth, ocean, and atmospheric research program focused around the scientific questions and societal hazards related to subduction zones. Applicants will be selected by the organizing committee and notified of their application status no later than 1 July 2016. Alexandra Navrotsky, Interdisciplinary Professor of Ceramic, Earth, and Environmental Materials Chemistry at the University of California at Davis, will receive the 2016 V. M. Goldschmidt Award this summer. The Goldschmidt Award recognizes major achievements in geochemistry or cosmochemistry consisting of either a single outstanding contribution or a series of publications that have had great influence on the field. Barbara Sherwood Lollar (University of Toronto, Canada) has won the prestigious NSERC John C. Polanyi Award for her pioneering research into billion-year-old water and the clues it may provide to ancient life on Earth and Mars. Laurence Yeung, assistant professor of Earth Science at Rice University, will receive the 2016 F.W. Clarke Award this summer. The Clarke Award recognizes an early career scientist for a single outstanding contribution to geochemistry or cosmochemistry published either as a single paper or a series of papers on a single topic. Edward Young has been named a Fellow of the Geochemical Society and of the European Association of Geochemistry. The award is "bestowed upon outstanding scientists who have, over some years, made a major contribution to the field of geochemistry". The DCO Deep Life Community realizes that the majority of deep microbial life has been resistant to cultivation in the laboratory, which complicates the characterization of physiological characteristics of deep community members. However, recent studies using bioreactor-cultivation techniques, under high pressure and/or temperature, have resulted in successful enrichment of previously uncultivable archaeal and bacterial components that mediate biogeochemical carbon cycling in deep subsurface. In order to maintain and strengthen cultivation strategies in future deep life missions, the DLC will support early career researchers to visit some key laboratories (Inagaki - Kochi, Japan, Bartlett - La Jolla, USA, and others) to learn and practice newly developed cultivation and cultivation-dependent molecular/biogeochemical techniques using samples from the Deep Life Community’s field missions. Financial support includes $5,400 per person for travel and lodging costs and host lab research supply reimbursement. Interested applicants should send their CV, a brief one page statement of their cultivation plans, and a letter of support from their intended host to Fumio Inagaki and Douglas Bartlett. Marilyn Monroe, who famously said, "Diamonds are a girl's best friend," probably hadn't heard of Sardinian ichnusaite. Ichnusaite, a pearly, colorless and brittle mineral, was discovered on the Italian island of Sardinia in 2013. Mineralogist Robert Hazen says that with only one known specimen, it's a true rarity. "If you wanted to give your fiancé a really rare ring, forget diamond. Give her Sardinian ichnusaite," said Hazen, co-author of a new paper categorizing Earth's rarest minerals. Billions of years of evolution on Earth have produced “endless forms most beautiful,” as Darwin poetically noted. 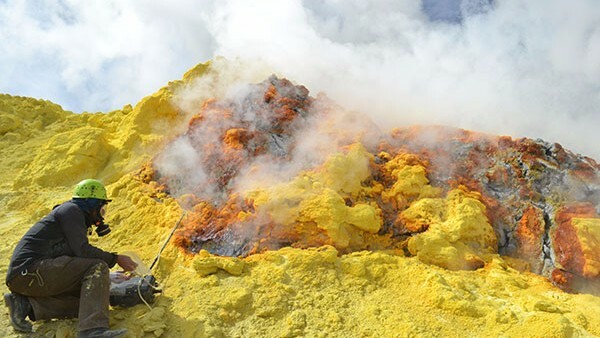 Some have evolved to live in “extreme” environments, such as deep sea hydrothermal vents and around the rims of lava lakes. Now, a new study published in Nature Microbiology reveals that extremely rare lifeforms have even managed to eke out a living inside the Earth’s crust itself. What the hell? In Hades, they have their own unique microflora. What hell holds for these organisms is largely unknown, except that they actually use carbon monoxide for energy. We have only just started looking at deep-sea and deep-in-the-ground life. These Hadesarchaea were first discovered in the US by Carl Woese, but now appear to be of even more immense significance. Scientists have categorised the Earth's rarest minerals. None of 2,500 species described is known from more than five locations, and for a few of them the total global supply could fit in a thimble. The researchers say it is important to hunt down these oddities because they contain fundamental information about the construction of our planet. Some will also undoubtedly have properties that are useful in technological applications. The list appears in a paper about to be published in the journal American Mineralogist. It is authored by Dr Robert Hazen, from the Carnegie Institution in Washington DC, and Prof Jesse Ausubel of The Rockefeller University, in New York. The world’s collectors come to Tucson each February, seeking to add a gem, fossil or rock to their collections. Some geologists, meanwhile, are collecting rockhounds — enlisting those collectors in a challenge to complete the mathematical map of carbon-bearing minerals. The theoretical map of undiscovered minerals is based on work done at the University of Arizona, led by Robert Downs, to compile an open-access database of minerals. 3 February 2016: Bénédicte Menez on "la tete au carré"
Rock samples from an underwater mountain in the Atlantic Ocean could help to explain how early life formed on Earth, or on other planets. In a 47-day expedition, researchers collected rock samples that reveal signs of life in the mantle of the ocean’s crust. The mantle rocks, which were collected by an international team using seabed rock drills, could provide clues about the reactions that fuel life in areas without sunlight, and the behaviour of carbon in such a setting. An international team of scientists - recently returned from a 47-day research expedition to the mid-Atlantic - have collected an unprecedented sequence of rock samples from the shallow mantle of the ocean crust that bear signs of life, unique carbon cycling, and ocean crust movement. These unique samples were collected using unique seabed rock drills. 30 January 2016: This theory about Earth will blow your mind! Stephen Nolan is overwhelmed when he speaks to Professor Edward Young who tells him that the Earth is not what he had believed. "For years we've thought that the moon was formed by a giant impact between two planets"
It's the only world besides Earth that man has set foot on. But we still don't know exactly how it got there. Now, rocks brought back by the Apollo astronauts in the late '60s and early '70s are providing new clues about how Earth got its moon. Earth has gotten a number of face-lifts over its 4.4-billion-year history, but in one respect, the planet may look the same way it did when it was young, new research shows. Primeval diamonds from Witwatersrand, South Africa, contain evidence that early Earth replaced its rocky outer plates with deeper-dwelling mantle rock, said Katie Smart, a geologist at the University of the Witwatersrand and co-author of the new study. The Deep Life Community is dedicated to assessing the nature and extent of the deep microbial and viral biosphere by exploring the evolutionary and functional diversity of Earth’s deep biosphere and its interaction with the carbon cycle.